All organs are vital, but some are more vital than others. Some organs are simple like our hearts, others notably complex, like our brains. The kidneys qualify as both vital and complex. You can live without a gallbladder, a thyroid, tonsils, or part of your intestinal track, but you won’t survive very long—just a matter of days to a few weeks–without at least one of your two kidneys. Why? Because the kidney continuously cleans yours blood and at the same time, controls your blood pressure, balances your body’s PH, and regulates vitamin D along with many essential hormones. What causes kidneys to malfunction? The leading cause of kidney failure in United States is diabetes, followed by hypertension. One of every 10 persons in the country has some form of chronic kidney disease compared to the one in 20 persons who lives with some type of cancer. The artificial kidney is less than the size of a coffee cup. Photo courtesy of the author. Chronic kidney disease eventually progresses where neither organ is doing its complicated life-sustaining job. Without dialysis or a kidney transplant, death is eminent. This is where local resident Heidi Miller stepped in last year to donate a kidney to save the life of a dying acquaintance, Bruce Cook, who had been on dialysis for five years. Most people are only two degrees of separation from someone with kidney disease. I never thought about kidney disease until my 24-year-old son was diagnosed with kidney failure. Since then I have become acutely aware of this life threatening challenge. At present, there is no cure for kidney failure. There are only two treatments: dialysis or a kidney transplant. Each is fraught with it’s own problems. When I speak to someone who is on dialysis or desperately trying to get a transplant, my heart goes out to them, because I’ve seen it all, up close. Fortunately, advances in biology and bio-technology are pushing a bio-artificial kidney towards the finish line. It will release hundreds of thousands of people from dialysis three to four times each week and provide the more than 100,000 people waiting for a kidney transplant with an immediate solution to their life threatening health condition. The bio-artificial kidney combines advances in stem cell biology with nano- technology and silicon engineering. It has been fast-tracked by the federal Food and Drug Administration because of its potential impact to treat end-stage renal disease. Dr. Shuvo Roy, professor of bioengineering and therapeutic sciences at the UC San Francisco, and Dr. William H. Fissell, a professor of medicine at Vanderbilt University, and other scientists are testing the bio-artificial kidney in large mammals. “Our hope is to scale up both the animal and clinical trials in humans to speed progress to the final device,” Dr. Roy said. The bio-artificial kidney will be able to both remove toxins and perform other delicate hormonal and regulatory functions done by the kidneys. Unlike a transplanted kidney, the recipient will not need immune suppressant drugs to keep their body from trying to reject a donor’s kidney. Thus the bio-artificial kidney could eliminate years of waiting for a suitable match to becomes available. Thirteen people die each day while waiting for a life-saving kidney transplant. In 2014, 4,761 people on dialysis died while waiting for a kidney transplant. Why are there so few kidneys available? Most of all because there are few heroines like Miller. A donated kidney has to be so carefully matched to the recipient’s blood type and other specific genetic characteristics. Testing for clearance to donate can take from three to six months before identifying an appropriate match. There is little doubt that it is downright scary to contemplate the surgical procedure of having one’s kidney removed and transferred to the body of another person, even though statistics clearly demonstrate that the procedure is safe and that kidney donors have longer average life spans than non-donors. This is most likely because the screening for donating a kidney is very stringent. Another barrier to kidney donation is the recovery period following surgery. Four to six weeks of rest and recuperation are recommended following the donation. That’s a lot of time off work and can result in financial hardship. While medical costs of donation are covered by the recipient’s health care, vacation leave and time away from work are not. Miller, who runs a boutique and newsstand, had to make extensive arrangements to manage her affairs before undertaking to donate a kidney. Fortunately, her recovery period was exceptionally short, and she lost little time away from her business. For a recipient, a kidney transplant is significantly superior to dialysis. But because the supply of kidneys is so limited, this isn’t a realistic option for most people facing kidney failure. This is why the bio-artificial kidney holds so much promise. It will not be limited by willing donors like Miller. Without need for immune suppressants, recipients of a bio-artificial kidney will be less susceptible to infection and able to resume a normal life more quickly and easily than those receiving a donor kidney. Human trials with the bio-artificial kidney are anticipated this year. 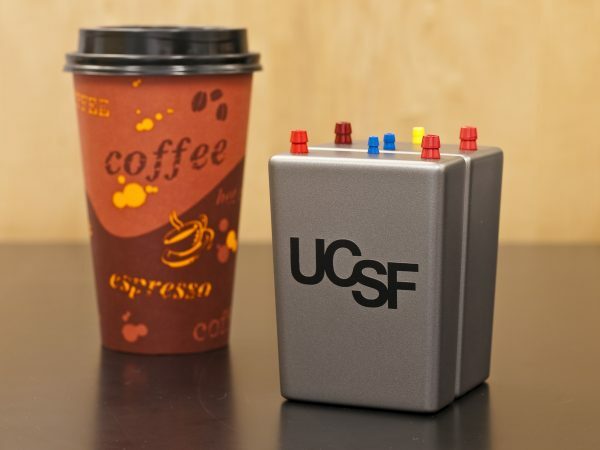 Progress is dependent on the resources available to the UCSF Kidney Project. More funding will permit simultaneous clinical trials, speeding up technical refinement and shortening the time such a device will be available. So tell your contacts about the Kidney Project. There likely is no more than two degrees of separation between you and someone who is facing kidney disease. Author Sherry Keith is professor emeritus of social sciences/history at San Francisco State University. She divides her time between Laguna Beach and Berkeley. This is an excellent piece. Thank you Indy and Ms. Keith. A much beloved mentor of mine in my personal and professional life died of kidney failure, and I had a kidney medical emergency described below while far away from home that nearly killed me. The old family friends who took me and my wife in for a five week recovery ordeal have a daughter in law who at the age of 18 donated a kidney to a cousin who would have died. Instead, we had the amazing experience of seeing the cousin and his wife and children at the the wedding of the courageous donor to the son of the friends who took me in during my own near death experience due to a kidney trauma. That is why I was so moved by the Indy’s coverage of Heidi Miller, the local businesswoman who amazingly donated her kidney to a stranger. I always tell people there is a reason God gave us two kidneys, because you need them twice as much as any other organ! Not a scientific or medical maxim, but you get the point. Kidney disease caused by diabetes and hypertension normally is far more life-threatening than renal pathology induced by kidney stones, which is what happened to me. But in support of Sherry Keith’s message here is my own story about learning the hard way to make kidney health a priority. In 2009 I was in Washington DC and went into emergency surgery to remove a large kidney stone caused by failure to drink enough water. Over the next month three botched surgeries by the same doctor almost killed me. Three strikes and he was out, so a friend took me to see a friend of his who happened to be the kidney guru at Georgetown University Hospital. He studied my file and told me the best surgeon in the country for me was at UCI Medical Center! I came home and Dr. Ralph Clayman saved my life. After I recovered it was my mission to tell everyone “We are all focused on heart, lung, brain, liver, gastro-intestinal, but you get kidney disease and you will wish you had a heart problem!” If you get kidney disease it doesn’t matter how the rest of your organs are doing, you suddenly are at risk of never recovering your quality of life and dying. Dr. Clayman not only saved me, I recovered 100% and had no need for drugs or any further treatment. God gave me another season of good health, and I am savoring every day that it has lasted since 2009. I am surfing better than ever! I just had a physical and we can’t find anything wrong! As instructed by the Georgetown stone man” and Dr. Clayman, I drink 60 ounces of clear water everyday, in addition to whatever other liquids I consume. That will add 20 years to your life, so you can die of something other than kidney disease! Believe me, there are a lot of better ways to go! That is why the prospect of an artificial kidney is arguably more important than people who have never seen kidney failure up close may understand. I am glad the Indy shined the light on this topic for your readers. Eagerly waiting for that bio artificial kidney which could offer my beloved wife a new life – a life where she would not have to confine her life to dialysis unit. Thank you for the excellent article Ms. Keith. By the time I need a third kidney transplant it could very well be one of these devices. Re: lost wages, the American Transplant Foundation provides grants of up to $1,000 for living donors to help remove financial barriers to donation. The application is done by the donor’s social worker and funds are directly disbursed to vendors such as the utility company, mortgage, cable provider, etc. You may find the Patient Assistance Program at americantransplatfoundation.org.